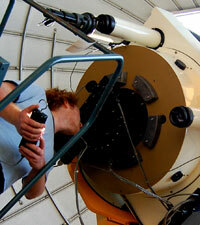 A minor in Astrophysics is offered to students who are preparing for a career in astrophysics or to those who are interested in an in-depth survey of modern astrophysics. The minor is open to students with a major in any discipline. Reflecting the reality that modern astronomy is really a subfield of physics, there are 4 initial core physics courses which are required (totaling 14 credits). These are to be followed by a number of optional courses which can be taken to make up the required 9 total astrophysics credits. Note that senior research (PHYS 499) with one of the faculty in astrophysics (see here) may count towards the minor, for a maximum of 3 total credits (subject to department approval). Interested students may wish to compare with the physics minor offered by the department; in a sense the Astrophysics minor is a more restrictive version of the physics minor and only one of the two will be granted (one cannot get both a physics and an astrophysics minor). Following completion of the above (required) courses, students should select at least three (3) of the following to acquire the mandatory 23 credits required to complete the Astrophysics Minor. All courses in the below list are 3 credits. It is recommended, especially for students not already engaged in astrophysics research with a faculty mentor, for students to begin with PHYS 304, which the department intends to offer every fall. However, it is not required, and the additional courses can be any of the above, taken in any order. Note that those courses marked by (R) will be taught on a regular basis, and the others less frequently. The department intends to offer Cosmology and Extragalactic Astrophysics in alternating Spring semesters going forward. *PHYS 499 only with approved Astrophysics Faculty – non-Astrophysics research for 499 credit will not count towards the minor. **Graduate-level course enrollment subject to pre-approval by faculty mentor and/or Associate Chair.